Firstly, that scarf wouldn’t be half bad if a better colour selection was used. Maybe monochromatic? While the wrap is pretty it would be more suited as a table topper. I find overly lacey wraps to be more decorative than functional, as they do nothing to keep you warm. They kinda look like adults wearing oversized children’s clothes. Yup – you can produce an even fabric, and it’s far too thick and heavy (especially if DK cotton). Or you can make it lacey – and look like you’re wearing a doily. What shall I do with this sweater dress that has turned out like chain mail? I agree the scarf is hideous, but a downsizing (ie smaller motifs) and a better color selection could transform it. 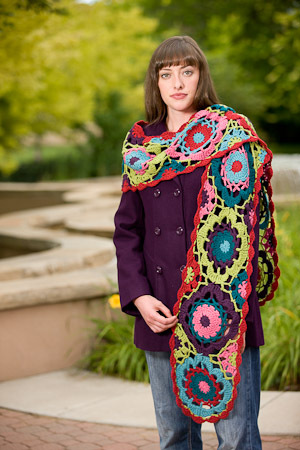 As far as the shawl goes, I think it’s quite lovely and wouldn’t mind making it if I wanted a decorative shawl to wear. I do, however, prefer my shawls to provide at least a minimal amount of warmth which that shawl, alas, won’t provide! One suggestion for your site, if I may: I realize you are looking to criticize stuff, but you really should provide at least a link back to the source for these pictures (unless you’ve received permission to post the copyrighted images here). Oops, this was supposed to go here. that the copyright owners have already posted to the web for advertising purposes. Well-informed folks do differ on this, but I think you’re wrong. The model on the cover looks like Ali, from The Biggest Loser program. Love the shawl she is wearing. The large-motifed scarf is a bit much = would definitely change colors. I actually like the flower motif shawl. 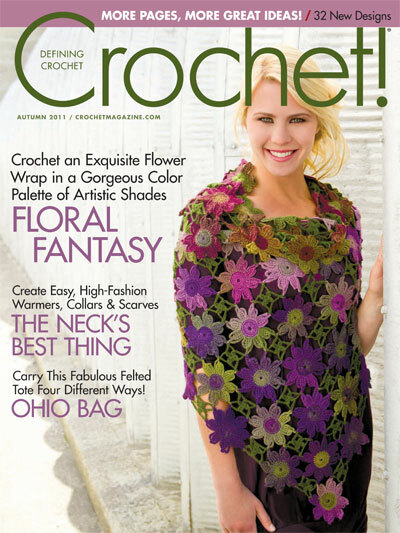 The first scarf is from the FRONT COVER of Interweave Crochet Accessories 2010! I don’t care for it either, I agree that a) it’s too big and b) the colours are too loud. I’m pretty sure that they did it just to make the magazine more eye-catching. The second pattern looks fine to me. I would never wear it, but I don’t see anything wrong with it. It is on the large side certainly. However, there is a difference from gaudy and bright colours. Is red always gaudy? I would not say so. The purple and the teal colour are quite dark and the other colours mid way. So I dispute your calling a colourful scarf gaudy. In the shops I visited recently were some beautiful knitted and crochet stuff. One thing was wrong with them; they were all without exception the most boring dull neutral colours. Beige, taupe, grey, black, etc. No wonder people are so miserable – perhaps their clothes reflect their miserable wintry mood but maybe it is the boring dull colour we choose to surround ourselves with that makes us feel miserable. Now the sun is gaudy, but you don’t hear people condemning the colour of that do you? Also don’t you think belittling people who choose to wear really quite ordinary colours is actually making it difficult for people who want to express themselves in what they wear but fear bullying and demeaning remarks? I do. You have to have a strong character to withstand people like yourself for instance and not everyone does. Shame that you have to belittle people with more inspired and creative tastes than your own, which are possibly very dull and grey. I don’t know though, as you don’t show us those do you? You just like to belittle others, not give us a laugh at your own expense as that wouldn’t be so funny now would it?